Hennessey Funeral Homes is planning a big Memorial Day celebration Sunday and Monday, May 29 and 30. 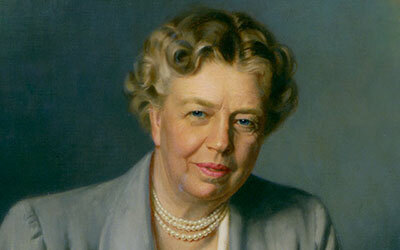 Entertainment by the Spokane Brass Works Band, a one-woman show about Eleanor Roosevelt, a replica of Abraham Lincoln's coffin, antique car show, refreshments and more at Hennessey's Spokane location, 2302 North Division. Natural Grocers, the Colorado-based natural food grocery chain of nearly 90 natural food stores opens a new store in Spokane tomorrow at 4603 N Division in a building that has been remodeled to make room for both Office Depot and Natural Grocers. The family-run company has a store in Coeur d'Alene, at 222 W. Neider Avenue at Highway 95. Started in Colorado in 1955, Natural Grocers specializes in organic foods and nutrition supplements. Saturday is local vendor day with samples and demonstrations, including Victor Azar of Victor Foods, and his line of locally produced hummus products. The Spokane store will be open seven days a week from 8am to 9pm. The phone number is 509-489-9900. 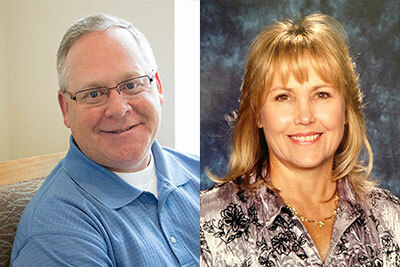 STCU has two new vice presidents. Sean Watt joins the credit union as vice president for retail delivery, while longtime employee Patricia Kelly has been promoted to vice president for information technology. Watt will oversee strategy and operations at the credit union's 18 branches in Eastern Washington and North Idaho. A University of Idaho graduate, he has 23 years of sales, lending and branch administration experience with financial institutions, starting with Key Bank in the 1990s. Most recently he was senior vice president of the Idaho region for Bank of the Cascades. A graduate of Park University, Kelly has 28 years of technical leadership experience, joining STCU in 2000 as the information systems manager. Most recently she was STCU's director of enterprise security and data management. Before joining STCU, she helped direct information systems operations for the U.S. Air Force. Kelly's record of community service includes positions on the Big Brothers Big Sisters of the Inland Northwest's board of directors and Gonzaga University's advisory board. She's a Meals on Wheels volunteer. 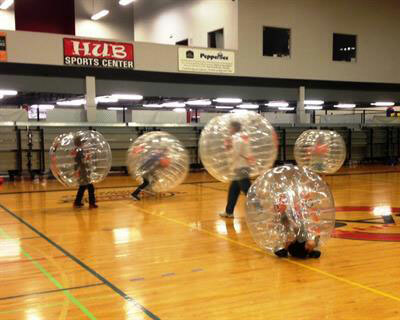 On Friday, April 22, the HUB Sports Center broke the world record for the longest game of BubbleBall. The final time was 6 hours, 51 minutes, and 16 seconds; breaking the previous record by 2 hours. Twenty teams from different companies, corporations, and organizations came out to play in this record setting event. Not familiar with BubbleBall? Think regular soccer played inside giant, protective, bouncing bubble suits that invites friendly and funny physical contact. Fun for everybody, players run, bounce, and bump into each other in a wild attempt to score goals. Created in Europe, this crazy sport has jumped the pond and is taking the USA by storm. BubbleBall is safer to play than most traditional mainstream sports, and equally entertaining to watch. To encourage excellence in all types and areas of architecture, the Spokane Chapter of the American Institute of Architects (AIA) holds a biannual Design Awards Program. Through the program, the Chapter seeks to honor works of distinction by its members and to bring public attention to outstanding architectural services rendered by its members. The 2016 AIA Spokane Design Award winners will be announced at the AIA Banquet which will be held on April 28 at the Spokane Club. Awards will be granted in two categories: Built over $5 million and Built under $5 million. Additionally, the Jury may grant Craftsmanship and Sustainability Awards. 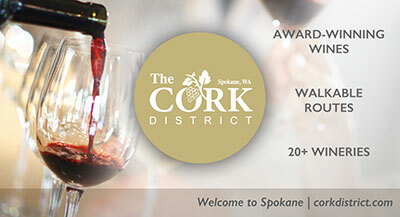 The Design Awards submissions will be displayed on the second level of River Park Square in downtown Spokane through April 27. More than 200 Spokane business and community leaders, as well as MDA Families, are putting their muscle behind finding urgently needed treatments and cures for muscular dystrophy, ALS and related diseases that severely limit strength and mobility at the 15th Annual an Evening with Harley-Davidson on April 30, to benefit the Muscular Dystrophy Association (MDA). The event, sponsored by Lone Wolf Harley-Davidson will be held at Shriners' Event Center, 7217 W Westbow Blvd in West Spokane starting at 6pm. Guests will enjoy a night complete with live and silent auctions, great food and entertainment, all while raising critical funds and awareness to help kids and adults in the Inland Northwest living with life-threatening neuromuscular diseases live longer and grow stronger. You can meet 14-year-old Marion Balderas, the Washington State MDA Ambassador along with other local families benefitting from MDA services. You will hear first-hand how your donations truly impact lives. Tickets are $50 per person. To purchase tickets or for more information about MDA's services, please contact the Spokane MDA office at 509-325-3747. The Kalispel Tribe of Indians unveiled its 1898 Public House at the Kalispel Golf and Country Club last Friday, April 22. For the first time in its 117 years, dining at the Club will be available to the public. While access to the Club's championship golf course and many additional year-round amenities still requires membership, the scenery from the clubhouse can now be enjoyed from every seat inside 1898 Public House. For more information about membership at Kalispel Golf & Country Club, visit www.kalispelgolf.com. The Radio Television Digital News Association awarded KREM 2 with four Regional Edward R. Murrow Awards, including Breaking News Coverage, Investigative Reporting, Sports Reporting and Best Website. All of the winners automatically advance to the national competition, with winners to be announced in October. In 2015, KREM won the national Murrow Award for Best Television Website in the country, for markets size 50+. The Edward R. Murrow Awards are presented by the Radio Television Digital News Association (RTDNA) for excellence in news reporting. Spokane SCORE Chapter 180 presents this week's workshop, Small Business QuickBooks Financial Management, on Wednesday, April 27 from 8:30am to 12:30pm. A QuickBooks expert will guide you through using QuickBooks as a bookkeeping and financial management tool. Learn tips and shortcuts and the keys to financial management, along with resources and financial management practices. The workshop will be held in the SBA Training Room, 801 W Riverside, Suite 444. 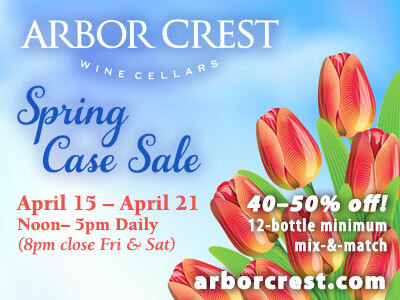 For costs, registration and more information, visit www.scorespokane.org. Grow Your Business through the right allocation of your media dollar, is the subject of a free program hosted by KREM, KHQ and KXLY TV. Learn the most effective use of advertising through broadcast TV, digital, social media, local cable, print, and radio. The program is on Tuesday, May 10 at the Lincoln Center, 1316 N Lincoln. Breakfast and registration begin at 8:30am and the complimentary program runs from 9-10:15am. Guests can enter to win a 40-inch Sony Smart LED TV. The event is presented by TVB Local Media Marketing Solutions. Space is limited, RSVP by May 3 to Kelly McKanna, kmckanna@krem.com, 509-744-8510. This year's Builders Breakfast, benefitting Habitat for Humanity is this Thursday, April 28 from 7:30-8:30am at the Red Lion Hotel at the Park, W 303 North River Drive. This is always an inspirational fundraising event and celebrates Habitat for Humanity' legacy of building impact in our community. To RSVP, call 509-543-2552 or email rsvp@habitat-spokane.org. The website is www.habitat-spokane.org. "The only limitation of our realization of tomorrow will be our doubts of today."